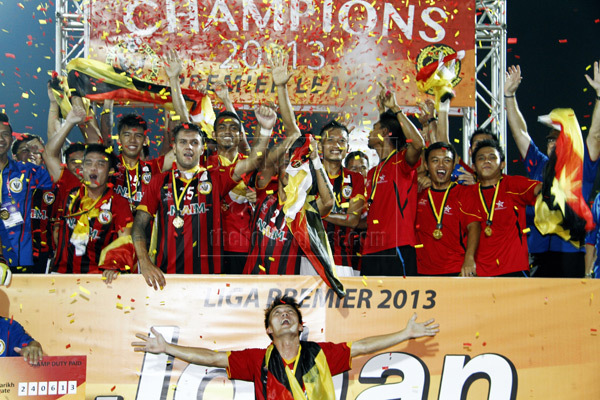 You are at:Home»Sports»Football»S’wak clinches Premier League title! 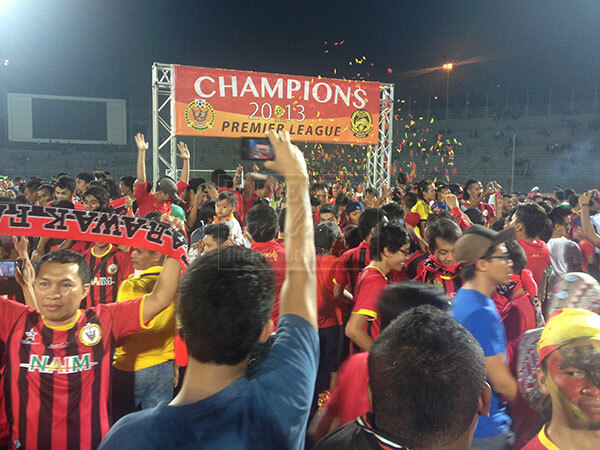 S’wak clinches Premier League title! KUCHING: The suspense is over. The festive mood had started as fans made Mexican waves early in the match at Stadium Negri last night. After 21 matches, the Crocs were finally crowned champions of the Premier League with a comfortable 4-0 victory over KL. 19th minute: Great solo effort by Muamer Salibasic ended in the opening goal. 68th minute: 2-0 after Ronny Harun’s long range shot found the net. 84th minute: Another good solo effort by Joseph Kallang Tie resulted in third goal for homesters. 88th minute: Final goal by Guy Bwele from a long shot. The Crocs have achieved their two key targets for the season: earning promotion to the Super League for next year and now topping the Premier League for 2013. 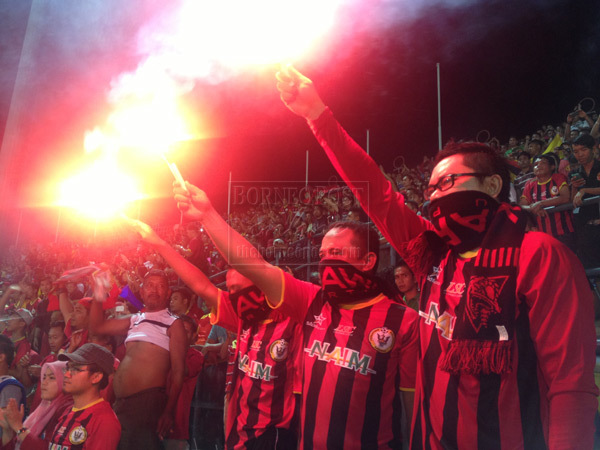 KUALA LUMPUR: Sarawak wrapped up the Premier League title in style by whipping Kuala Lumpur 4-0 in their penultimate match of the season at the State Stadium in Petra Jaya, Kuching, tonight. 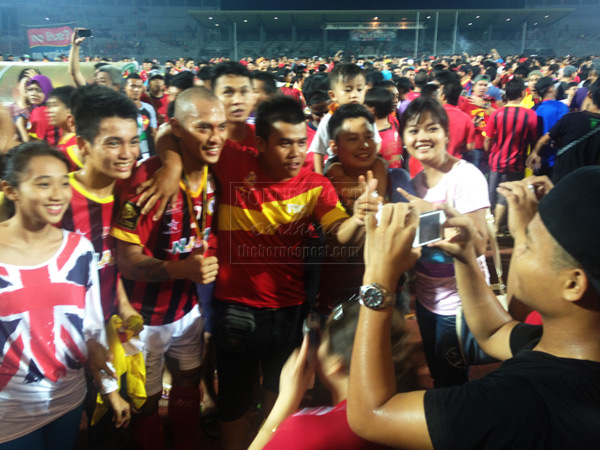 The win saw Sarawak who were awarded the Premier League title and RM300,000 prize money after the match, maintain their 100 percent unbeaten record and make a comeback to the Super League next season. But while the Sarawak players were drowning themselves in newfound glory, neighbours Sabah suffered an embarrassing 1-6 defeat at the hands of Johor. And while Sarawak were promoted to the Super League, former powerhouse Kuala Lumpur and newcomers NS Betaria FC were relegated to the FAM League. Sarawak, under coach Robert Alberts, has won 17 of their 21 matches played and drawn the remaining four to collect 55 points, four more than second placed Sime Darby who will not be able to catch up since there is only one more match left for both teams. Consolation for Sime Darby will be earning an automatic promotion to the Super League next season. Sarawak’s goals were scored by Muamer Salibasic (20th min), Ronny Harun (68th min), Joseph Kalang Tie (85th min) and Guy Bwele (88th min). Sime Darby meanwhile, sealed second spot with a 2-0 win over UiTM FC at the UiTM Stadium in Shah Alam while Johor registered a big win by whipping Sabah 6-1 in Johor Baharu.